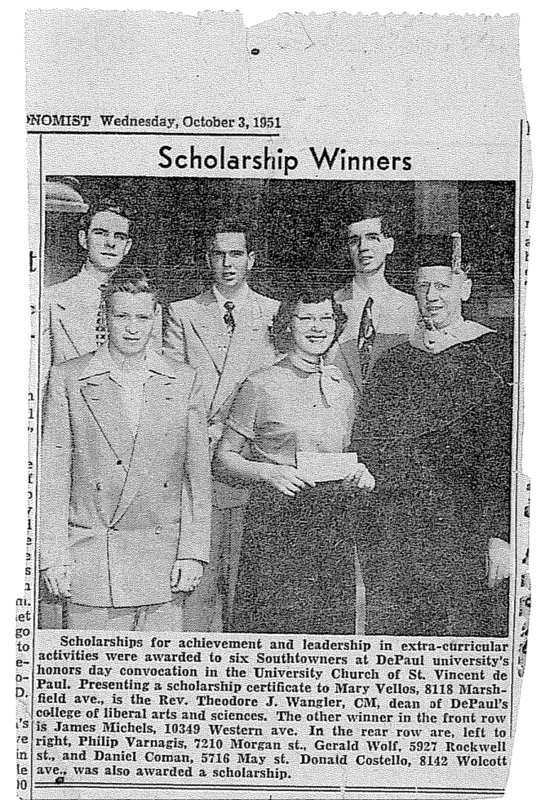 This photo is from the October 3, 1951 edition of The Southtown Economist, a daily newspaper on the South Side of Chicago, when my grandmother, Mary Klonowski, was 18. She attended DePaul University against the wishes of her father, who didn’t want his daughters to be college educated. She received a BS from DePaul in 1954 and was the only woman chemistry major in her class. She later earned a master’s in mathematics education and became a high school math teacher. She is now 80 years old and still working as a substitute teacher. This entry was posted in Chemistry, Mathematics. Bookmark the permalink. I LOVE THIS. I’ve subscribed and will follow with interest. Part of my life is to curate interesting posts about tech for BlogHer.com. I’m hoping I can find a way to feature some of your stories there in the future. I see you have a Twitter account. Will follow there, too. I’m vdebolt on Twitter. My high school algebra teacher was Mary Klonowski, at Lyons Township High School, LaGrange. After school had ended, in the summer, I had not finished my computer project, which involved punch cards. She came in to work to make sure I finished and converted my Incomplete to an A. She gave me the “Ketchup” award — as in “Is it too late to turn in the last 10 assignments? I work in Technology today, and I still think about that. Mrs. Klonowski was one of the first teachers to make a personal sacrifice for the benefit of my academic performance, and that made a world of difference to me. My academic performance had previously not been that important to me, and had been only a mild curiosity to my family. Her sacrifice helped me see the importance and I became a top student and a person with higher standards, who got a third degree in Information Technology at age 51. She is a very remarkable lady and one of my heroines.